Real-time in the field engineering solutions. CECO Mechanical Field Services delivers on site service, analysis, repair, and replacement for air, gas and petrochemical compressors of all sizes and designs. 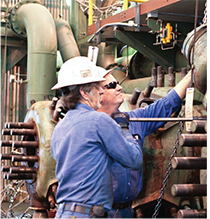 Our expertise ranges from full compressor overhauls to servicing gas gathering, processing and gas pipelines. 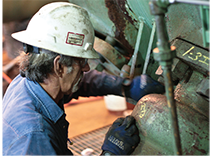 Our field crews have extensive experience servicing engines and compressors in the oil and gas industry. Our core ethic is quality for our customers. At CECO we do it right! Manufacturing and Precision Repair Centers. Throughout the length of the project, we analyze compressor and engine performance to maximize your productivity. We provide expert engineering support 24 hours a day 7 days a week, with real-time access. On site, faster, and more effective, CECO delivers. CECO Mechanical Field Services can extend the life of your compressor through redesign and rebuilding, or overhaul the compressor to run at optimum efficiency. CECO’s compressor overhaul service includes everything from cylinder removal for reline services or field installation of slip fit liners, to furnishing and installing engineered equipment, pistons, rods, piston rings, and rider bands, as well as repairing packing cases. CECO has been delivering OEM SuperiorSM products and services to the gas transmission, gas processing and petrochemical industries since 1964. The background, skills and expertise of CECO Mechanical Field Services expands our industry leadership in maximizing compressor operations and costsaving services and products. ® CECO is a registered trademark of Compressor Engineering Corporation.